Defense stocks had a choppy 2018 after years of steady growth. There's one company that stands out heading into 2019. General Dynamics (NYSE:GD) has had a rough go of it in 2018. The company, down 16% for the year, is the worst-performing large-cap defense stock and trails the S&P 500 by about 15%. Over the past five years, the picture for General Dynamics has been rosier, with shares up 90% compared to the S&P's 49% climb. However, the stock still trails the performance of rivals during that time period. Yet for new cash today, General Dynamics is in my view the single best buy in the defense sector, as I believe that the weakness that has led it to underperform in 2018 will become a strength in the year to come. Keep reading to learn why General Dynamics is my top defense stock to buy in 2019. Defense stocks enter 2019 full of uncertainty, with investors posing questions about valuations and growth rates and worrying that Washington gridlock could roll back Pentagon spending gains that helped fuel the five-year rally. That said, with geopolitical tensions running high and pressure on the United States to keep up with Russia and China, there is reason for optimism as well. Defense stock five-year movement vs. S&P 500 data by YCharts. Investors looking for safer defense stocks have tended to look at Lockheed Martin, with its predictable revenue streams from long-term contracts and expertise in areas where the Pentagon is prioritizing. Harris, an under-the-radar defense electronics firm, also looks to be an enticing buy, assuming it can successfully integrate its pending merger with L3 Technologies. But that doesn't take away from the huge potential that General Dynamics has. 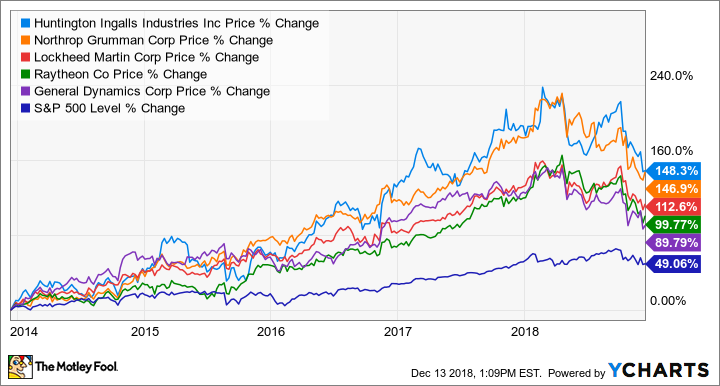 General Dynamics has underperformed its rivals in the last few years primarily due to issues at its Gulfstream business, which has never fully recovered from the 2008-2009 recession. I had hoped to see a turnaround this year, with business jet sales expected to recover due to an aging fleet, changes in tax law, and firming prices for used jets. However, the July bankruptcy of Gulfstream supplier NORDAM Group stalled that progress. Gulfstream's G500 business jet. Image source: General Dynamics. Gulfstream in September acquired the NORDAM line that manufactures the nacelles for engines on the newly introduced G500 and G600 jets to try to mitigate any issues created from the bankruptcy. But production fell behind during the summer months. Gulfstream said previously it plans to deliver up to 10 G500s in the current quarter using nacelles produced before the bankruptcy filing, but admitted it could take well into the first quarter of 2019 to get production caught up. This issue has made it difficult for Gulfstream to provide firm delivery dates for new planes, which appeared to have handed rivals Textron and Bombardier a sales advantage. Gulfstream's book-to-bill ratio for the third quarter was 0.76 times, compared to 1.2 times for its competitors. General Dynamics executives have said that as clarity around delivery times has improved, so too has interest in the planes. Gulfstream continued to manufacture G500s even without the nacelles and should be able to catch up on deliveries in the early part of 2019. New models tend to be less profitable at first due to production line start-up and testing costs, but by the second half of 2019 and into 2020, Gulfstream should be able to grow revenue aggressively and generate over-20% margins. Unfortunately for General Dynamics shareholders, the Gulfstream issues have diverted attention away from a defense business that is on the upswing. Key parts of the defense business are currently transitioning toward new early-stage projects, but those projects should pay off in the future. Defense programs typically tend to improve in profitability with maturity, and in the case of General Dynamics, engineering and early work on the DDG guided missile destroyer and the Columbia-class nuclear missile submarine both weighed on results in recent quarters. CEO Phebe Novakovic on a call with analysts admitted that's not going to turn around overnight, but she's confident there will be improvements as the program develops next year. Elsewhere, General Dynamics' massive land vehicle operation appears likely to be a primary beneficiary as the U.S. Army refocuses its attention away from fighting insurgencies and toward countering a major-power adversary like China or Russia. The Army as part of that shift seems likely to de-emphasize the nearly 40-year-old Bradley Fighting Vehicle, made by BAE Systems in favor of a forthcoming next-generation combat vehicle (NGCV). General Dynamics' Griffin design is seen as a favorite for the NGCV, competing against BAE and Raytheon, and GD and BAE are also competing for a separate light-tank award. Given what General Dynamics already has on its books, it's reasonable to expect 6% to 8% organic growth in 2019 and into 2020 even without any new major program wins. And even if the budget axe falls on the Pentagon, the Columbia, as a key piece of the U.S. nuclear triad, is likely to be funded as planned well into the next decade. As noted above, the Gulfstream recovery has progressed slower than I expected, but I continue to view General Dynamics as the most compelling stock among major defense firms. General Dynamics today trades at 16.8 times earnings, a 35% discount to Lockheed Martin and a 16% discount to Raytheon. That discount is not warranted based on the relative strength of the defense operations and should shrink considerably, assuming Gulfstream in the quarters to come can show growth. No defense firm has a more straightforward path to grow earnings and improve its valuation. General Dynamics is a great company with a poorly performing business. With that business set to recover, General Dynamics is the top defense stock to buy heading into 2019.